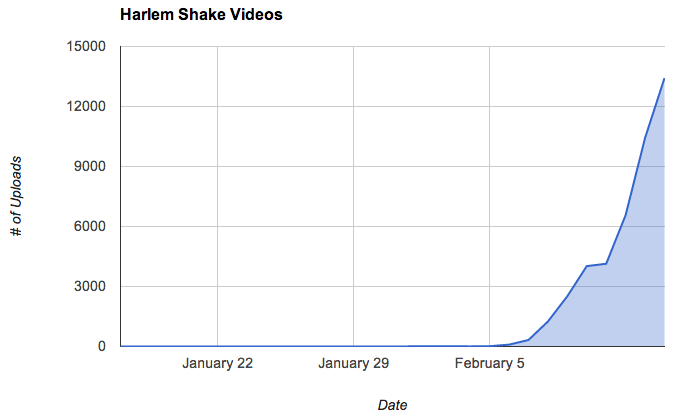 Depending on your frame of reference, the "Harlem Shake" is best known as dance move from the 1980s, a dance track by Baauer, or the biggest web video trend of the month. If you need to get caught up to speed, here's a playlist of some of the most-popular iterations of it from the past few days. The meme first started gaining traction last week and is attributed to a silly video from a vlogger named "Filthy Frank." Though it was another user named SunnyCoastSkate who then established the form we've become familiar with: the jump cut, the helmet, etc. From there, the spin-offs spread very quickly. 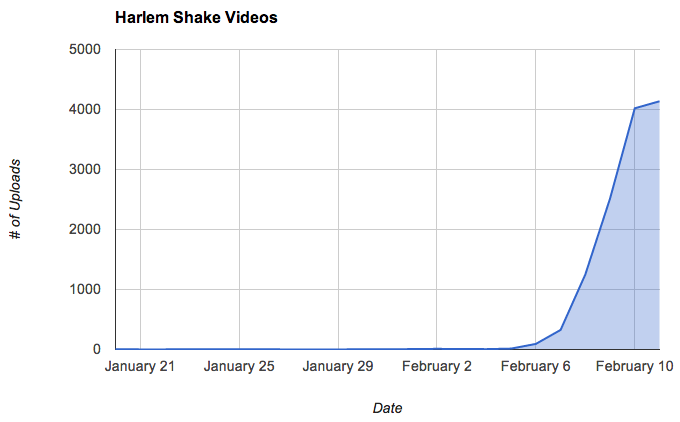 As of the 11th, around 12,000 "Harlem Shake" videos had been posted since the start of the month and they'd already been watched upwards of 44 million times. As you can see in the chart below, over 4,000 of these videos are being uploaded per day and that number is still likely on the rise. Musicians Matt and Kim produced a pretty epic one that's been circulated widely on social media. It's been performed by the young... and the old. Some of the many subgroups we've seen are swim teams and U.S. service academies, and there are plenty more on the way, we're sure.